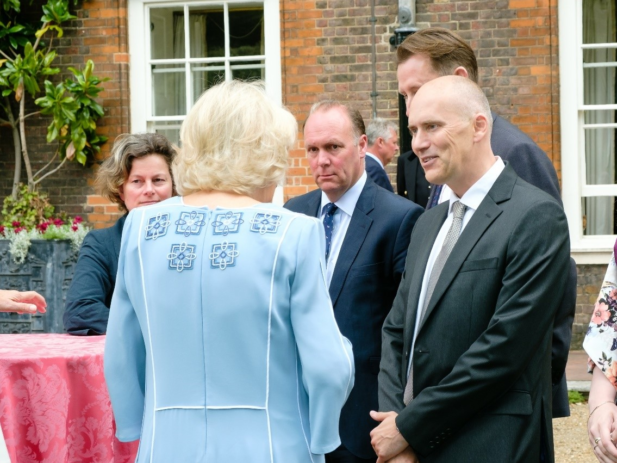 HRH The Duchess of Cornwall attended a special reception at Clarence House on 13th July to mark The Duchess’s 70th Birthday, alongside supporters and representatives from the charities Her Royal Highness supports. The Duchess of Cornwall is the Patron of the Cornwall Community Foundation. Tamas Haydu, Chief Executive, represented the CCF and thanked Her Royal Highness for her continuing support. The CCF awards grants to young carers and people in crisis on behalf of the Duke of Cornwall’s Benevolent Fund in Cornwall. In the last twelve months, more than 160 young carers benefitted from the support. The Duke and the Duchess of Cornwall have always shown a keen interest in the work of the CCF. One example of the sort of support the Duke of Cornwall’s Benevolent Fund offers would be the award we made to a very special young 12 year old who helps her mum and dad care for her brother who has severe autism. She helps dress her brother in the mornings and helps at meal times. Her mum comments ‘She has a calming influence which allows tasks to be done a lot quicker and quieter’. They are no longer able to go out together as a family so as a break for the young girl this fund supported riding lessons. Her mum comments ‘She has more confidence now, she also has an escape and hobby that is just for her, something that has been difficult for a long time. Thank you so much to the Duke of Cornwall’s Benevolent Fund. It has made such a difference to her life’.